The All Valley Legislative Lunch held May 12th was not unlike many legislative events our valley hosts annually. Local Assembly and State Senate members shared updates on pending legislation, current initiatives, and projects that are important to them. There was some common ground, some not so common ground, and a broad array of ideas and visions for the future of our valley. Oh yeah, and there was a leading candidate for California Governor on the stage. Wait, what? Nearly a year ago the Greater Coachella Valley Chamber of Commerce was formed to lend a strong regional voice to the business community in our valley. At the time many involved in launching it saw clearly the need to bring together industry from across the valley in an effort to pool resources and work together on issues and opportunities that effect us all. Our valley economy is a strong engine tied together by a diverse weave of events, agriculture, retail, hospitality, and tourism. The more that diverse business base communicates, the more influence they have in shaping the valley’s future direction. What may not have been so clear at the time of it’s formation was just how loud that voice would be – loud enough to reach Sacramento. California’s economy is big, so big it would be the sixth largest in the world if stood alone. Standing out in a business community that large can be tough. 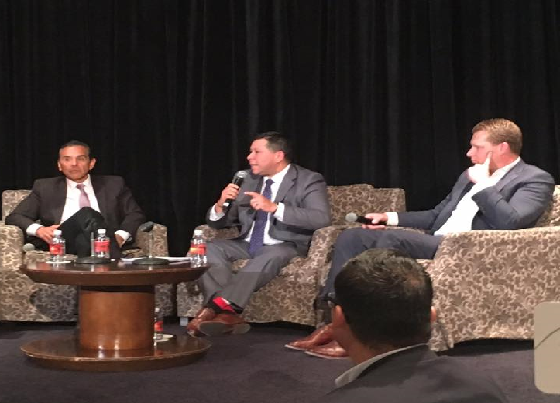 And yet last Friday, on stage in front of 300 local Coachella Valley chamber members stood Antonio Ramón Villaraigosa, the 41st Mayor of Los Angeles and a leading candidate in the 2018 California Governors race. How did he get there? That is a story I will save for another conversation. I can share this, he would not have been there if it were not for the formation and regional influence of the GCVCC. That is a fact. As our economy continues to get closer and more interconnected, regionally and globally, the ability to be a relevant part of the conversation is paramount. What happens in Los Angeles, San Diego, San Franciso, and Sacramento impacts our valley. The GCVCC understands that. Our goal? Whether it is a phone line 500 miles away, or a moderated stage 50 feet away, we will continue to be part of the conversation. Joshua Bonner is President & CEO of the Greater Coachella Valley Chamber of Commerce (GCVCC). The GCVCC is the largest Chamber in Riverside County with over 1,400 dues paying members. It officially represents the city’s of Cathedral City, Coachella, Indio and La Quinta, as well as the Cabazon Band of Mission Indians and the Twnety-Nine Palms Band of Mission Indians.